SER is a global specialist provider of renewable energy staffing services. 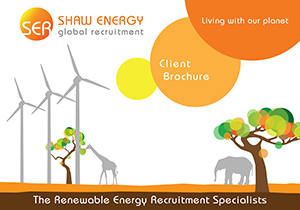 With worldwide multi lingual consultants we provide a comprehensive staffing solution to the global renewable energy market. SER offers a truly dedicated and complete renewable energy recruitment solution, always ensuring a professional and personal service to meet all your staffing demands. SER is dedicated to our clients in the renewable energy jobs marketplace, and boast diverse successful candidate placements in all renewable energy solar jobs, wind jobs, hydro jobs and biogas jobs. Making the right investment in people is essential to your business. It's not enough to just match someone's skills with a technical specification & job description. The renewable energy market benefits from someone's strong environmental ethics, the same approach to work as the employer and someone who can add value not only to a job but also to the development of a company’s ethos and profile in the marketplace. SER will always pay attention to all your renewable energy recruitment requirements, down to the smallest detail, taking a very professional & personal approach to ensure the very best return on your essential employee investment. So sit back and let us do all the work.